SEGA has revealed the release date of Yakuza 0 for North America and Europe: January 24. The game will be available for PlayStation 4 only. New screenshots inside. Are all these games from the series on the same engine? I really can't tell the difference between versions. Gotta admit that the Yakuza games don't look amazing. But at the same time i don't know of any other series that do what they do, so i kinda give it a pass anyway. I imagine that the returning characters and pretty much all the games being set in Kamurocho doesn't help either. It does look very similar, for sure. I will buy this even though it frankly looks like a PS3 game. Well, it actually looks a lot better than its PS3 version, which is probably the whole reason why it doesn't look very good. 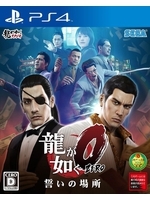 Yakuza 6, which only has PS4 version, looks way better than this.